You may protect your child from sunburn and tell them to look both ways when they cross the street, but are you doing what you can now, to protect them from developing cancer later in life? When we hear the words high cholesterol, high blood pressure, or heart disease, we often imagine older adults, not children! But with today’s technology, we have the power to spot the early signs of heart disease before any symptoms manifest, and the results are shocking. When are our kids at risk for heart disease? By measuring cholesterol in healthy children, and examining the arteries of kids and teens that have passed away, we have learned that heart disease starts young- very young. In one study, 70% of overweight children had at least one risk factor for heart disease, and 39% had two or more factors. 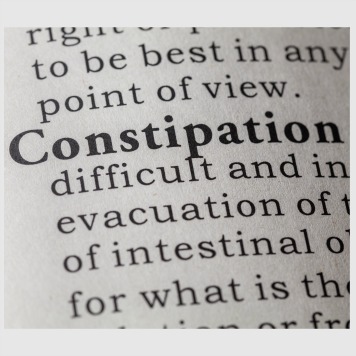 Risk factors include high blood pressure, high cholesterol, high triglycerides, and insulin resistance. The more risk factors one has, the greater the chances of developing heart disease that damages the cardiovascular system. As overweight and obesity increased, the proportion of children with at least two risk factors increased from 5% to 59%. 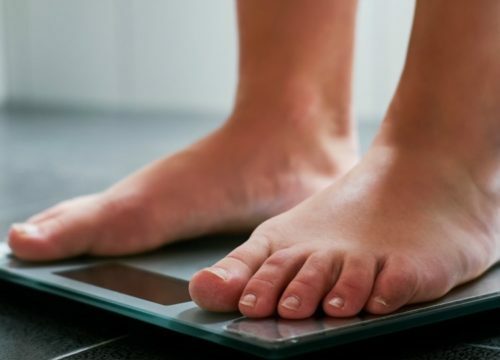 Excess weight starts early, with more than one-third of children and adolescents now overweight or obese. What causes heart disease at young ages? We know that arterial walls begin to develop fatty deposits that build up over time. This process begins in childhood, promoted by a Western diet of highly processed foods, damaging fats, too much sugar, and salt. In autopsies performed on young males (mostly victims of trauma) with an average age of 26, atherosclerosis was observed in 78 percent of the men. In another study, scientists autopsied 2,876 young accident victims (ages 15-34) and found that an alarming 60 percent of subjects in the youngest group (ages 15-19) had atherosclerosis. In another study, scientists autopsied 2,876 young accident victims (ages 15-34) and found that an alarming 60 percent of subjects in the youngest group (ages 15-19) had atherosclerosis. Why are heart disease and cancer prevention in kids spoken about together? It’s because you can’t see cancer. You can’t measure it like heart disease in youth. Although we now understand how crucial it is to live a healthy lifestyle and provide good childhood nutrition in order to prevent heart disease, many parents don’t know that cancer prevention also starts in kids! Lifetime habits start early, and how and what your family eats has a strong influence. Our toolkits are a great way to start the conversation, beginning with learning more about powerful plant foods! You certainly don’t think of preventing pancreatic, endometrial, colorectal, kidney, postmenopausal breast, or gallbladder cancer starting with kids. Yet, we know overweight and obesity is responsible for over 120,000 cases of cancer in the United States each year. Today, nearly 1 in 2 Americans develop cancer at some point in their lives. WOW! The best news is, we’re not powerless. Research shows 1 in 3 cancers is preventable through diet and lifestyle, and that’s not accounting for smoking! A parent’s love doesn’t stop when a child turns 18, so why not turn on their cancer protection now, and shield them early in life. Choose 2 colors of fruit or vegetables to eat at each meal. Track your colors for a week using the Super Crew Color Tracker in English and in Spanish. Add herbs and spices to your dinner to enhance flavor without the use of salt. Experiment with a different whole grain this week, like amaranth, red quinoa, barley, buckwheat or millet. Choose fruits or veggies over chips or pretzels as snacks. Aim for one more veggie a day- which meal can you add it to? Compare packaged food with the ingredients in a homemade recipe –see which one offers more real foods for your body. Swap a soda, sweet tea, or flavored drink for water during one meal a day. This small step can save you almost a thousand calories each week. Be more active. If you can’t get in 30 minutes a day, break it up into 15-minute intervals. Take a 15-minute brisk walk with your kids and then play 15 minutes of Wii Fit! Check out this fitness toolkit, that has fun activities for the whole family. Make a commitment today to choose a goal that says NO to cancer and YES to cancer prevention. Don’t let your good intention disappear. Write it down, post on the fridge, schedule it in your calendar, and make it happen! 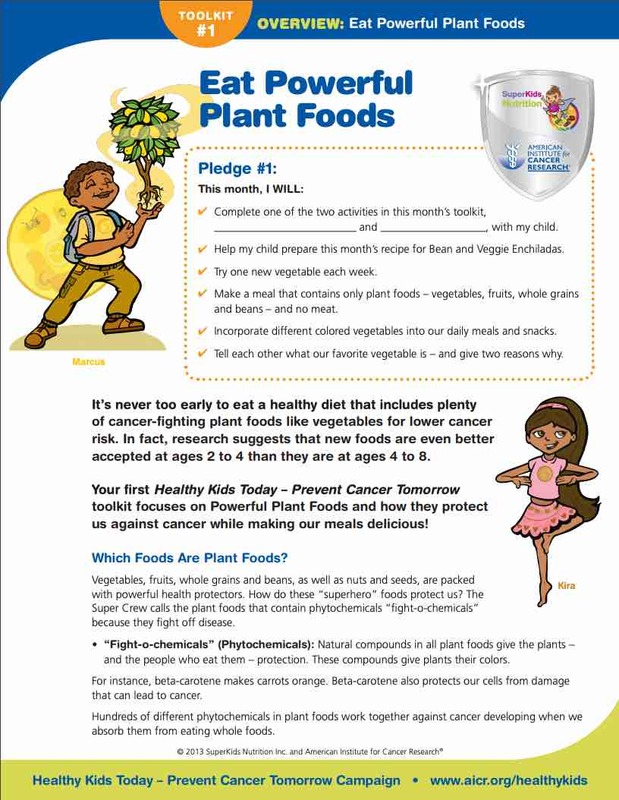 Check out the Healthy Kids Today, Prevent Cancer Tomorrow Campaign. There are 5 toolkits, each with a different food-related health theme that can work for your family. Download them today! Moms and Dads – Stuck in a Weight Loss Plateau? Nutrition Myth: Are Packaged and Processed Foods Healthy?